That’s it! no complex Nahuatl pronunciations this time, simple and straight forward: Quesadillas are a famous and standard breakfast or supper in many Mexican homes, they are prepared with a tortilla and typically cheese, this is where the name comes from: [Queso-Cheese / Tortilla = Quesadilla] However, the filling is up to the cook, it can be cheese and turkey sausage, cheese and mushrooms; or simply mushrooms saute with onions and a bit of garlic, you pick! Tortillas in Mexico are made of corn flour and in the central and south side of the country you will find that quesadillas are mainly prepared with a tortilla that looks yellowish (just like in the picture below) In the north, people prefer to use wheat tortillas, just like the ones we find in Ireland. Another interesting element to quesadillas is that in many Mexican homes they are the perfect way to get the family working together: children can do the cheese shredding/grating, adults can work on the fire and other younger people can help setting up the table by bringing the guacamole and other salsas, and this is what makes quesadillas so enjoyable. Quesadillas made with corn tortilla and Oaxaca cheese. 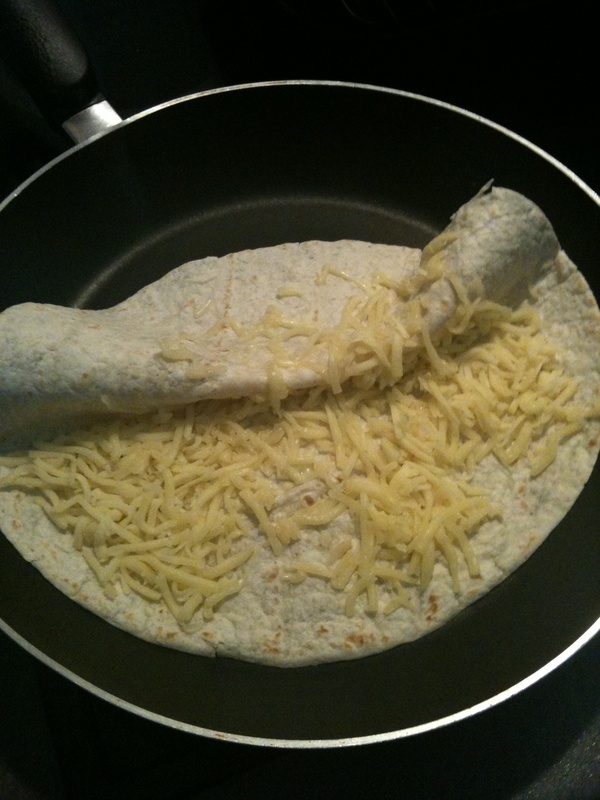 The classic presentation of a quesadilla is a tortilla folded in half and the cheese melted inside. Generally, this is accompanied by a salsa of your choice and a bit of ‘pico de gallo’ (a side salad that I will be posting soon) Now, time to go shopping and source the best possible ingredients to get the best out of such a simple recipe. In Dublin, you will find wheat tortillas in nearly every supermarket or convenience shops: Tesco, Superquinn, Dunnes, Marks & Spencer, Spar, Mace, Londis, etc. However, I do recommend that you buy the ‘generic’ brand versions of it: they are less expensive and the flavour is exactly the same. For those who are watching their daily calorie intake, prefer the smaller versions. 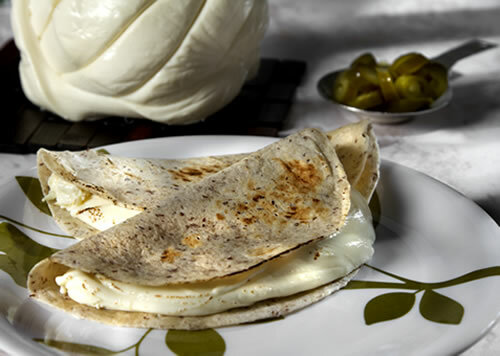 The cheese used to prepare traditional quesadillas in my native Mexico City is called ‘Oaxaca’ cheese, which its distinctive ball-like presentation makes it stand out from the rest and it is a cheese that can be shredded by hand. Oaxaca cheese is very mild and creamy in flavour. In Dublin, you can replace Oaxaca cheese for any good quality Mozzarella or Gouda. If you don’t have any of these at home, white mild cheddar will do. 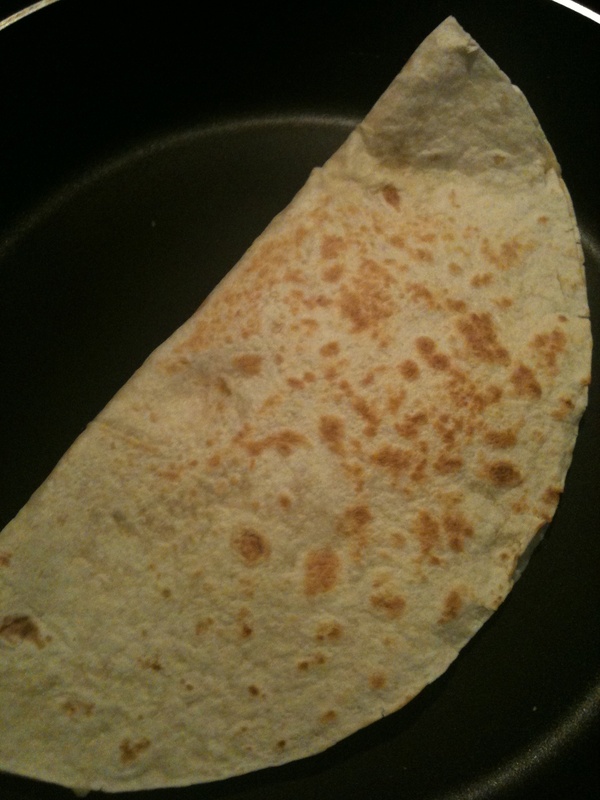 How to prepare them is very simple: grate the cheese, then put a non-stick pan to medium heat, then place the tortilla on it, and turn it around every now and then until it is warm, now it is time to add the grated cheese and fold the tortilla. The absolute key to a very nice quesadilla is that your pan is to medium temperature and that the quesadilla is constantly turned so you don’t burn any side as this will cause the tortilla to become very hard, and a nice quesadilla should be just lightly crispy. Once you have that, for presentation you can place them on a board with salad, and guacamole. In some Mexican homes, people prefer to place the quesadillas in tea towels, and wrap them to keep them warm and soft. Then, they are placed at the center of the table along with guacamole, chillies and salad so people can help themselves. 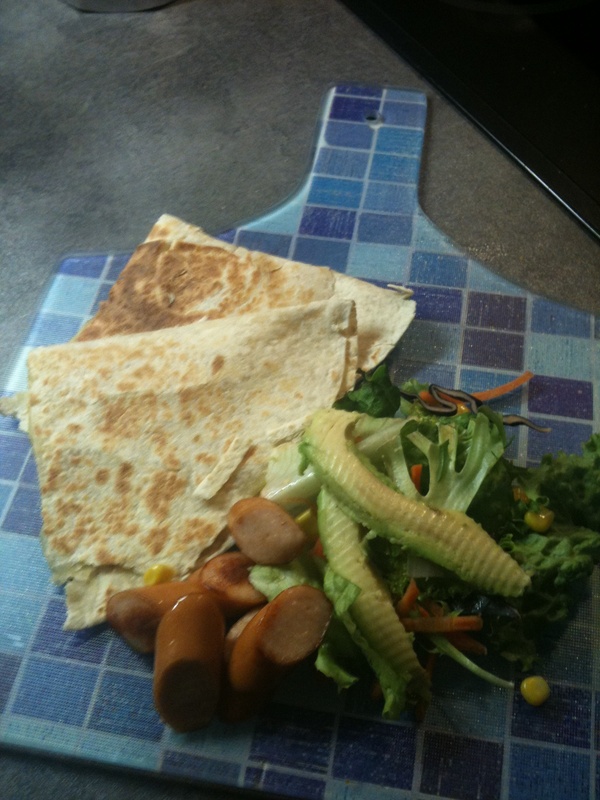 I will post this week how to prepare different fillings for quesadillas, in the meantime… Buen Provecho!